“Just a good ol’ boy. Never meanin’ no harm. Beats all you’ve ever saw, playing guitar with his paw since the day he was born”. Not quite the most original sentiment, but the words of Waylon Jennings have never been lost on Whitey Morgan and the 78’s. The roots of country music are despair, pain, sorrow and anguish. Feelings found in great abundance in the burnt out ghost town of a once great automotive oasis in the rural backwaters of Michigan. Formed in 2005 and hailing from Flint, Michigan (That’s nowhere near Nashvegas) where the factories are closed, jobs are scarce and the people are bitter; Eric Allen, better know as Whitey, channels the spirit of Waylon, Merle and Willie. Named for the grandfather that taught him how to play in the first place and the jeers he got attending a mostly African American high school Allen had one guiding philosophy, to bring back real country music. With the classic themes of country music (drinking, prison, hitting the road, loving and leaving women) as the only options for the residents of Flint, Whitey and the boys have distilled the essence of country music into 150 proof melodies to help people forget their problems for a few hours and serve as the guideline for drinking sorrows away. 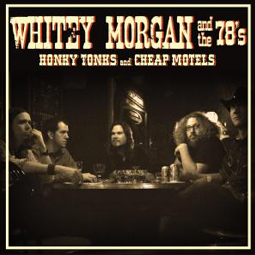 Their Small Stone debut “Honky Tonks and Cheap Motels” will bring out everyone’s dancing shoes and while Whitey plays, the world is a better place. This has not gone unnoticed outside of Flint, as Whitey Morgan has in very short order managed to share the stage with the likes of Shooter Jennings, David Alan Coe, Hank Williams III, Dale Watson, Richie Albright and the legendary Leon Russell. Look for them on the road this Fall and remember- There are no flipflops in country music. There is no Margaritaville or sandy beaches for outlaws. Engineers: Eric Hoegemeyer @ Rustbelt Studios and Jerry Bridges @ Nighthawk Studios. Mixing: Al Sutton @ Rustbelt Studios. Mastering: Chris Gooseman @ Solid Sound.